Just as this is also the last day of the week, it's also the last day of the month and that means that it's time to say Goodbye to April 2017. The start of the month was very strange and very unusual for April. There were thunderstorms and floods a plenty during that first April week of 2017! The second time this year and the third time within five months. In all fairness, it wasn't as bad as during the December 2016 or January 2017 floods, but they did attract attention. Plus, as already mentioned, they were rather unusual floods for this time of the year! 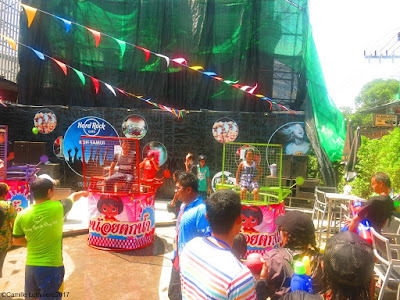 The big event this month was Songkran or the Thai New Year celebrations. A good time was had in Chaweng with the family and it was busy. For food we visited the usual suspects, Kobori, excellent Japanese food in Maenam and Nathon. Juzza Pizza was also on the list in Fisherman's Village and some awesome pork sateh and 'rad na' at Dcheed 2 at the ring road in Chaweng. Here's to Goodbye to April 2017 and bring May 2017 on, as of tomorrow! See you all next month. Here's the Koh Samui, Thailand weekly weather update; 24th April – 30th April, 2017, the last week of this month of April 2017. The day started really early, at 3am with a 4am two and a half hour long slow distance run, as part of my 15 week training plan for the up and coming Koh Samui marathon on 25th June 2017. At 3.30am that day you can find me at the start line of this marathon. The race course covers my weekly training runs! A home run indeed. Last week saw a nice and wet Monday, with surprisingly a bit of rain. Most other days have been sunny, but with partial cloud cover as well. It was sticky hot each day though. Max temp reached 35C last week. Next week, the first May week looks very promising and very similar to this current last week. Sunny with partial cloudy skies. Get that sun lotion out and enjoy Koh Samui's beaches and atmosphere. It's showtime again soon for the 16th Samui Regatta from 20th to 27th May 2017. The Samui Regatta is slowly but surely becoming an institution on Koh Samui, although in my book, still a bit of an event for the elite. The event is proudly hosted by Centara Grand Beach Resort - Samui, which is widely regarded as the "Home of the Samui Regatta". The Regatta is organised by Regattas Asia in conjunction with the Samui Yacht Club Regatta, under the auspices of the Province of Surat Thani, the Sports Authority of Thailand, the Municipal of Koh Samui, the Tourism Association of Koh Samui, The Tourism Association of Thailand, the International Sailing Federation and the Yacht Racing Association of Thailand. Increase tourists to the island of Koh Samui. Increase awareness and participation in watersports in Asia. Support youth education and sporting activities on the island. Starting with just 11 boats, mainly made up of beach catamarans, the event gained a reputation for offering great hospitality and competitive sailing. The fleet has now grown into one of the most competitive in Asia and is now placed as the final event of the prestigious Asian Yachting Grand Prix Championship. Crowning the 2016/2017 Asian Champion Skipper and Crew at the last night Awards and Gala Dinner. Held at Centara Grand Beach Resort. Despite these challenging economic times, the event has grown every year to become a truly international event with around 500 competitors joining in annually from over 22 different countries. Generating an estimated 30 million baht worth of media coverage and over 18 million baht into the local Koh Samui economy annually. A day late but here we are nonetheless with the Koh Samui, Thailand weekly weather update; 17th April – 23rd April, 2017. Yesterday I was doing my lsd or long slow distance run. Pretty much immediately after that three hour run I was off to the local hyperbaric chamber for work. After that it was shopping and taking care of the children and visiting the Samui Green Market at Six Senses. A busy day with not much time to update the blog, but today is looking different and here we are indeed. Koh Samui, Thailand weekly weather update; 17th April – 23rd April, 2017; Ready for take off. One of Bangkok Airways' Boeing 737 planes is ready for take off at Koh Samui airport. There's a short cut route that leads around the Northern runway, where you can spot the action. Planes coming in and taking off and giving great photo opportunities when you have to wait for the road to be opened up again. Last week saw partially cloudy to fairly cloudy skies and we even had a few raindrops mid week. The last couple of days and over the weekend it was blue skies galore however and the max temp went up to 35C! The forecast for this week is looking great in case you're in search of sunshine. A few isolated clouds, no rain and plenty of sunshine is out and about. Get that sun lotion ready and enjoy Koh Samui at it's hottest! 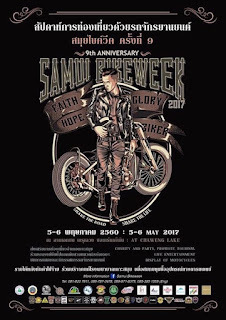 It's on again, the 9th Samui Bike Week, 5-6 May 2017 at the by now familiar location of Chaweng lake. 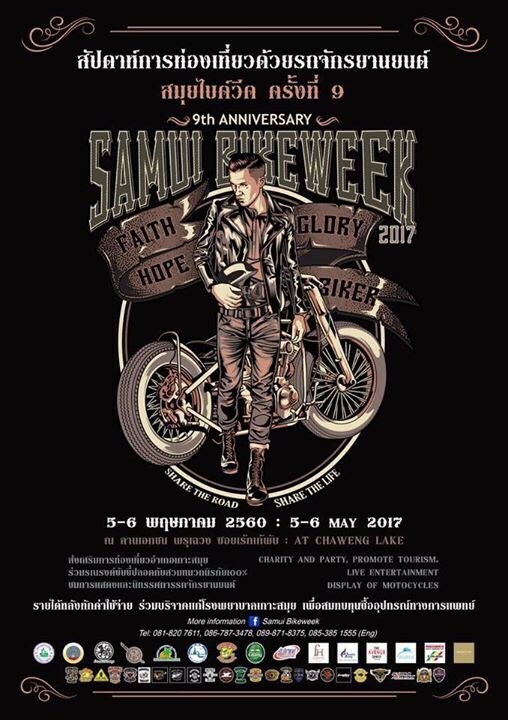 If you would like to see lot of cool big bikes, the 9th Samui Bike Week, 5-6 May 2017 is the right location for you and the place to be. I have visited the Samui Bike week in the early days but during recent years I wasn't always on Samui when the vent took place. However the bikes on display are truly amazing. Lots of choppers and customized bikes can be spotted. A feats for the eye, in coolness and color level f the various bikes. Black is a favorite color in general but many bikes actually have some cool paint or spray jobs done. Make time to visit this 9th Samui Bike Week at Chaweng Lake, if you're on the island . It will be well worth your time and give you a couple of very cool photo shoot opportunities. Hope to see you there, I will be on Koh Samui this year and am looking forward to go and check out the bikes again. It's Sunday morning and time for the Koh Samui, Thailand weekly weather update; 10th April – 16th April, 2017. This Sunday morning is partially cloudy with a nice breeze and at 9.30am we have a current temp of 30C. It's looking like another hot day is in the making. Last week it was hot and sticky with hardly any rain at all, I don't recall seeing any rain at least where I was during last week. It was sometimes partially cloudy but it was also very humid. Temperatures ranged from 32C to 33C, so very solid. The forecast for next week is looking good, sunny most days with the fresh breeze dropping and if you're lucky you find some quick and short tropical rain shower to cool things down a bit. April at it's best! 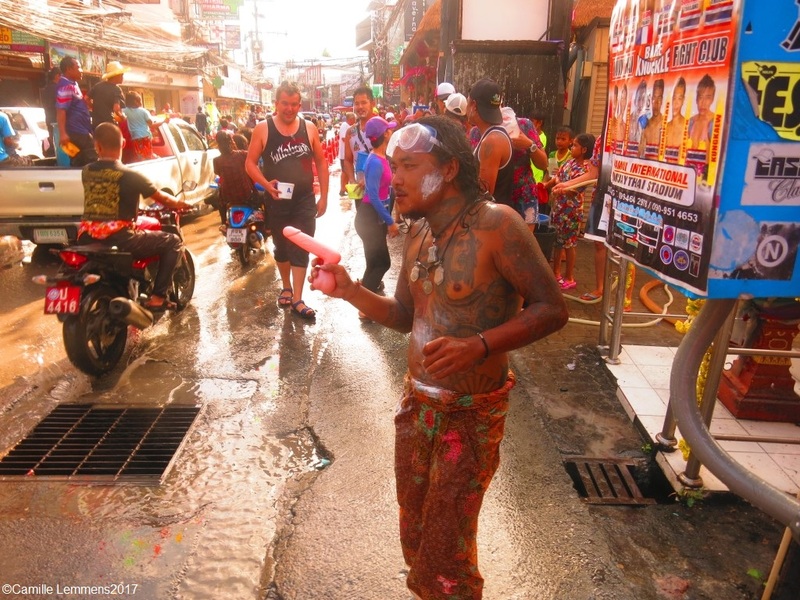 It's hot and dry today, but that can't be said for Songkran 2017 in Chaweng yesterday. At least not the dry part! It was a lovely day with blue skies and hot, but by no means was it dry! The water fights were on all over the island as part of the Songkran tradition! During the morning I played a bit with our children but the afternoon the whole family moved over to Chaweng to join the festivities there. Around 2.30pm we arrived with some of our friends and soon met up with more friends and their children. We were a big group of around ten people when we were all together. Most of the time smaller groups split off from the main group though to enjoy certain areas of Chaweng. 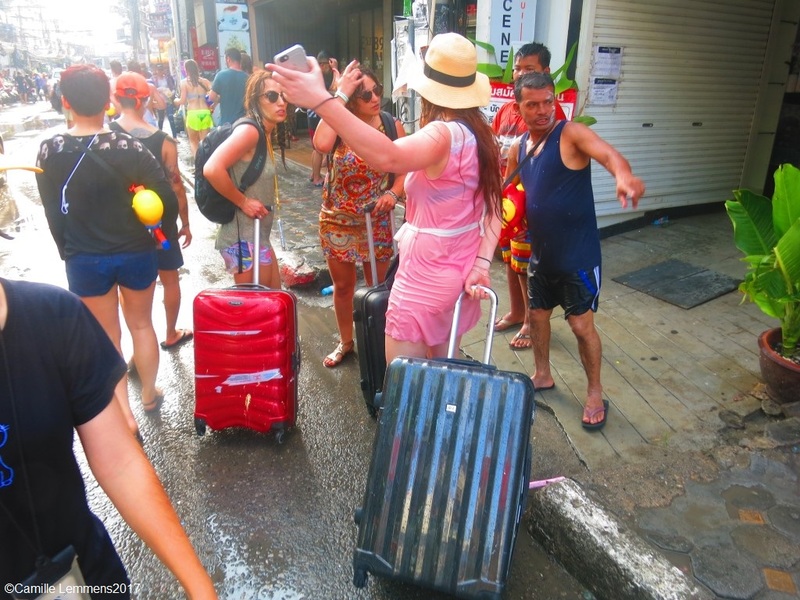 There was a good atmosphere in front of the Central shopping mall at Chaweng's beach road and the busiest part this year was without doubt at Bar Solo where crush barriers and security were deployed to keep the crowds in place and order. 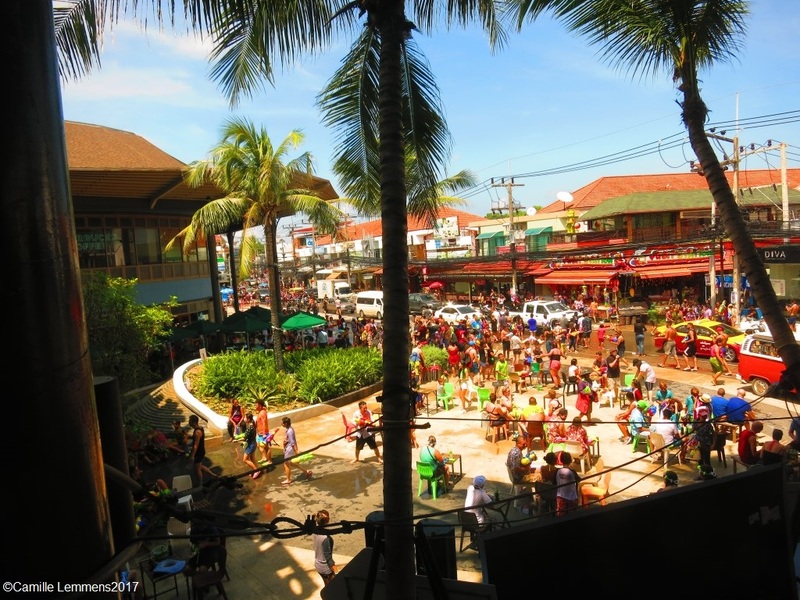 It was busy as each year that I spent on Songkran on Koh Samui although it didn't seem to get really busy until around 4pm. In general I felt that it wasn't as busy in Chaweng as during previous years but there was a good atmosphere and the crowds were lined up all around the island, on the main road and all the smaller sois. There were plenty of special activities around the Central shopping mall in Chaweng, like the foam party and concerts later during the afternoon and evening. The late hours saw lots of folk out and about in the bar areas of the island, both in Chaweng (Soi Green Mango and Soi Reggae) and in Lamai. If you were on Koh Samui yesterday or in general in Thailand, I hope you enjoyed this years Songkran version! 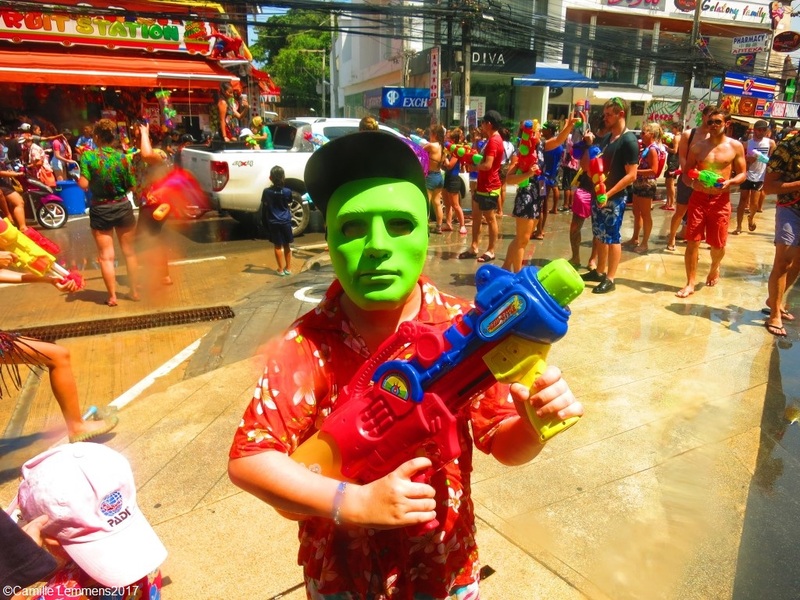 I'm really pleased that the water fights only take place during one day on Koh Samui but there are a few places around the country where two or three days is the norm. That's a little bit too much of a good thing for me! Songkran 2017 in Chaweng; Now where was that hotel that you booked? 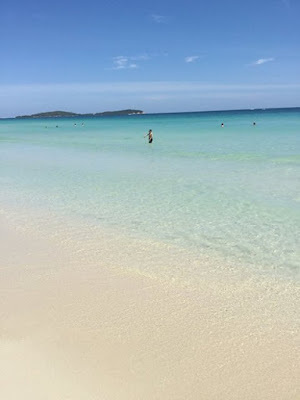 The Koh Samui, Thailand weekly weather update; 3rd April – 9th April, 2017 but first things first and that's today's update. This morning saw some rain though, around 5am, during my long Sunday morning run (26.6km in two and a half hours) for about half an hour and I enjoyed every minute of it during my run, since it cooled things down really nicely. Very enjoyable! Don't miss out on on today's big event in Maenam where there will be a bike cross event all morning and into the afternoon. Last week was as unusual for the start of the month of April as it can get! There was a lot of rain and plenty of flooded area around the island. By all means, not as bad as during the recent December and January floods, but they were very unusual. In all my 18 years now on Koh Samui I've only seen this before, and on a l\much larger scale back then, in 2011. Since yesterday the sun is back again though and the weather has changed into a much more April like condition! As a small welcome back celebration back home we had dinner at Kobori in Nathon yesterday and the Japanese food was up to the expected standard as always. Well worth checking out in either Nathon or Maenam. All week long I was on Koh Lanta where we had sunny mornings and most of the time cloudy and rainy afternoons, also rather unusual for that time of the year on Koh Lanta. The PADI IE went very well and all of my four candidates passed the exams very successfully. Koh Samui, Thailand weekly weather update; 3rd April – 9th April, 2017; The pier on Koh Lanta where all ferries to Koh Phi Phi and Phuket as well as in South bound direction, like Koh Lipe and into Malaysia arrive and depart each day. Now here's what most of you are looking forward to, the weather forecast for next week. Well, to keep it to the point, it looks like it's going to be fab! Sunny skies and warm and hot days are ahead of us next week and no rain at all is predicted! 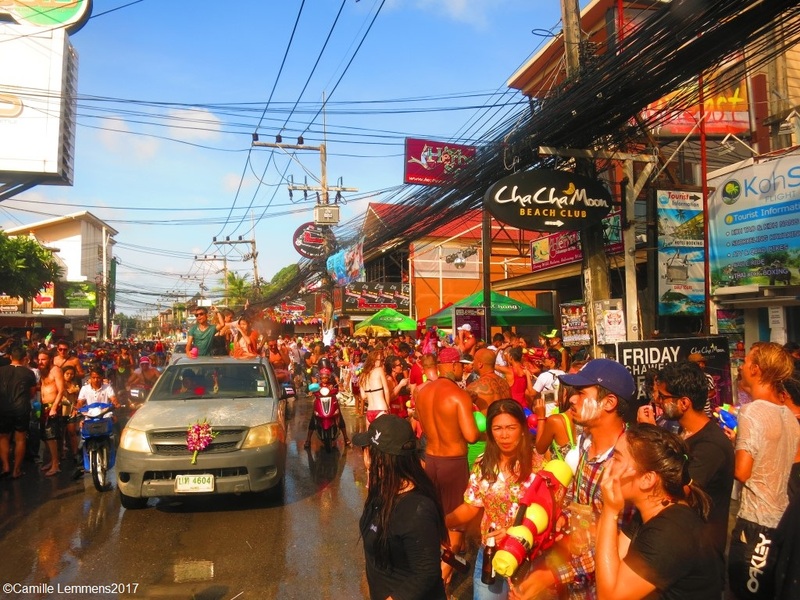 Next Friday 14th April sees Songkran, if you are here on Koh Samui, an event not to be missed, and hard or impossible to miss. Enjoy it! 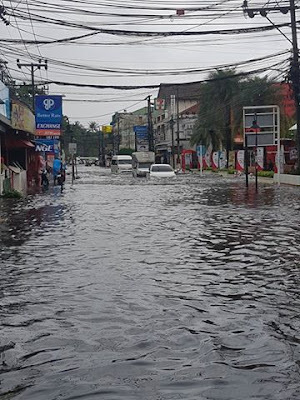 As we all know by now, there are Unusual hard rain and floods around Koh Samui for April. The last couple of days saw unusual hard rain and this caused floods at the usual 'hot spots' around the island. 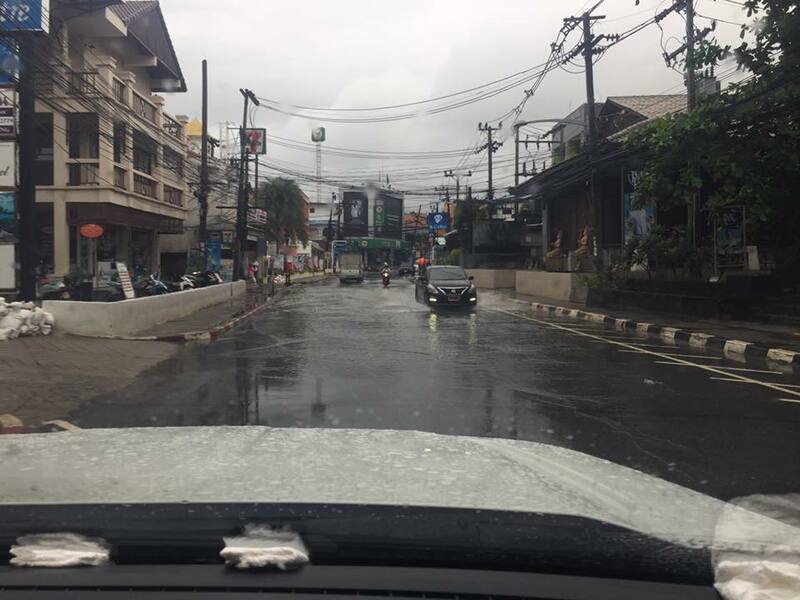 Affected areas were in Chaweng; where the one way system starts, near the Centara Grand Beach resort and the market on the way to the ring road. Maenam had some flooding and other parts of the island to minor degrees. This morning at 7am it is 27C and although dry, heavy clouds loom over Koh Samui and more rain is expected. Tomorrow morning and afternoon should see some rain again and come Saturday the weather should change and it should stop raining and the sun might be making a come back. Hang in there, just a few more days. If you like the blog and find it useful, don't hesitate to make a donation! I have set up a new PayPal link here; PayPal.Me/CamilleLemmens. 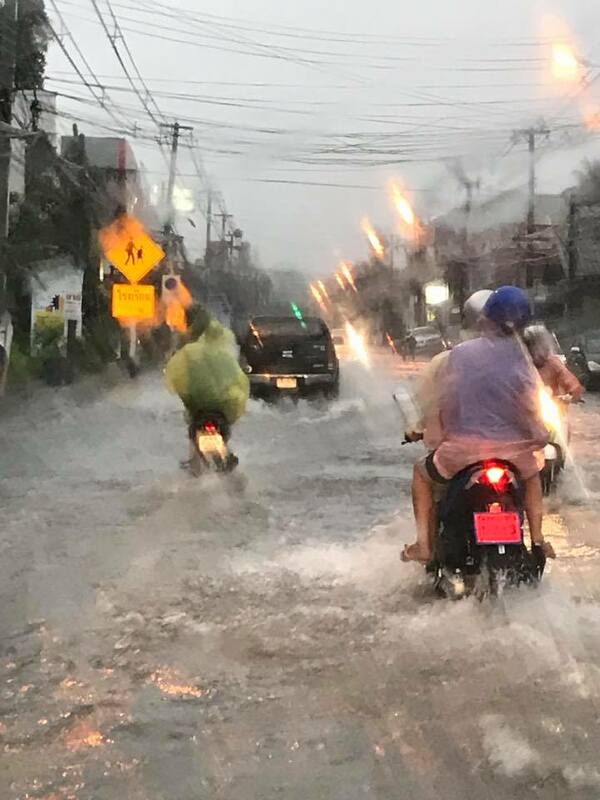 Unusual hard rain and floods around Koh Samui for April; Flooded road near the Clock Tower square in Chaweng, where the one way system starts, two days ago. This time around it wasn't as bad as the floods during December and January, but it's very unusual for this time of the year, which is supposed the driest and hottest time of the year, to have such hard and prolonged rain. Unusual hard rain and floods around Koh Samui for April; Flooded roads in Maenam two days ago. The only time I can think of that it rained so hard in April was back in 2011, before the current drainage system was installed and the water stayed on the roads for around two weeks after it stopped raining. After 2011 a new drainage system was installed and now the flash floods still take place but once the rain stops or slows down, the water disappears quickly. The majority of the floods occur because the water has no direct natural run off route. Most run off routes to the ocean are blocked nowadays by buildings, mostly resorts and hotels. The price of progress? 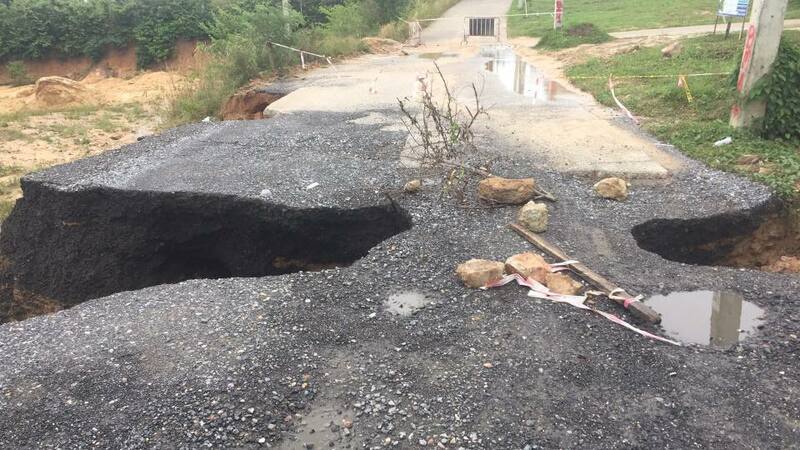 Unusual hard rain and floods around Koh Samui for April; The damaged road in Choengmon was temporarily fixed and with the first signs of heavy rain immediately collapsed again. What's next, the second temporarily fix? Thanks for following the blog and I hope that you still had an enjoyable time on our island! Everybody suffers in these conditions, the locals as well as the people that planned a holiday to a sunny destination that turns out to be not sunny at all. Despite what the weather statistics tell you! Like i said before, hang int here for just a few more days and hopefully the sun will return. Our kind hosts at Six Senses Samui are concerned about hospitality - we can't get hold of enough tents for vendors at such short notice, and the temporary car park is just a muddy puddle....quite messy, they report. Even though it's due to clear on Sunday 9th April, the ground is still soggy and muddy, and we can't take the chance. The Next Samui Green Market is on 9th April at Six Senses and it looks like it will be great event, once more. This will be the second time that the Samui Green Market is welcomed by Six Senses Hideaway, the first time being end of August last year. The setting is great, with great views over the Gulf of Thailand, shaded by trees and will be held at Sis Senses Samui Farm on the Hill. Besides the usual vendors, selling locally grown, locally sourced and locally crafted products (have you tried the French cheeses yet, delicious, or the bread for sale!!) there's also a goat farm, chickens, water recycling and more, all done with re-used materials and sustainability in mind. It’s not hard to find, follow the signs from Big Buddha to Arayaburi and drive past that, and there’s a lot of parking space available. Please note the Samui Green Market will be open from 4pm to 7pm. It's always a pleasure and enjoyable to visit the Samui Green market and I hope you will find the time to visit, last August it was very busy here! Here we are with an update of last week, the Koh Samui, Thailand weekly weather update; 27th March – 2nd April, 2017. Currently I'm on Koh Lanta, teaching a PADI IDC program and the weather here is in general lovely with blue skies and a hot sun in the morning but each afternoon clouds move in and the late afternoon always sees rain, for at least half an hour to an hour and sometimes for a couple of hours, just to turn sunny and hot the next morning again. Last week saw a nice week around Koh Samui with plenty of sunshine but also two very wet days. Lots of people immediately went into panic mode but people relax. 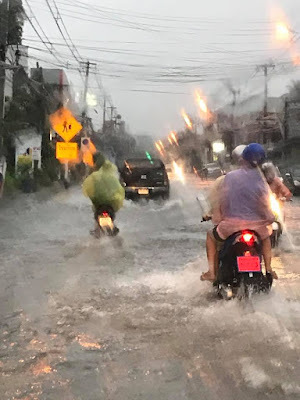 Before we have a very unusual situation like the floods in December or January, first of all it typically will require monsoon season, which it isn't right now and before floods in such a magnitude happen around Koh Samui, we need a couple of days with prolonged and/or non stop rain. Non of that applied to these two days, no reason to get upset or start panicking. Also, many people contacted me regarding the weather forecasts, these forecasts work with precipitations, with the slightest pro cent chance of rain or thunder, such an icon will appear. That doesn't mean at all that there will be rain or thunder, even sometimes regardless of the potentially high percentage listed. It's difficult to predict weather correctly a week in advance, let alone more than a week, so relax people. April is supposed to be the hottest month in the year on Koh Samui, any rain is unusual but welcome, since it cools things down. Temperatures last week ranged from 29C to 32C, not a bad week at all, although we had two a-typical rainy days for this time of the year. The forecast for next week is looking ok-ish. As already explained, you would expect hot and sunny weather, which we will have. However, rather a-typical. there is some rain expected with short tropical shower like rain for today and tomorrow. Tuesday and especially Wednesday may be wet but after that it should be blue sky and hot sunshine galore. Despite it being 1st April today, it is indeed time to say Welcome to April 2017! 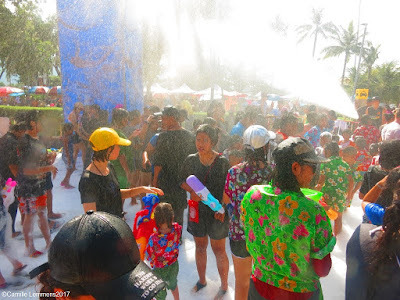 Usually April is the hottest month of the year around Koh Samui and the driest, although in recent years we actually had some unexpected rain at some days, and it seems especially during Songkran or Thai New Year which can be expected 14th April. In general though, April should be sunny and hot, period! This year looks different though, since this morning the weather forecast that I use, has turned, and not for the better! Until Friday 7th April, it seems we may have rain every day, maybe Thursday 6th might be fairly dry during the daytime. This is very unusual and we will see how this will turn out. If it rains as much as is predicted right now, we may actually see some prolonged flash floods and some roads being partially flooded. I don't expect anything like the floods we had in December 2016 or in January, but rather a 'watered' down version, pun intended! Hang in there, according to #45, climate change has nothing to do with it. Seriously though, I hope it will be storm in a water glass! April should also see an increase in tourists visiting our lovely island, due to the already mentioned Songkran or Thai New Year festivities and Easter holidays in the Western world. Sadly enough, Songkran will also go hand in hand with the deadly seven days around Thailand, when people move the area they work, back to their home and/or birth places and many, mainly motorbike accidents, will happen, and sadly, many accidents will be fatal. The Thai news papers keep track of the yearly carnage and updates will be available on my Facebook page. 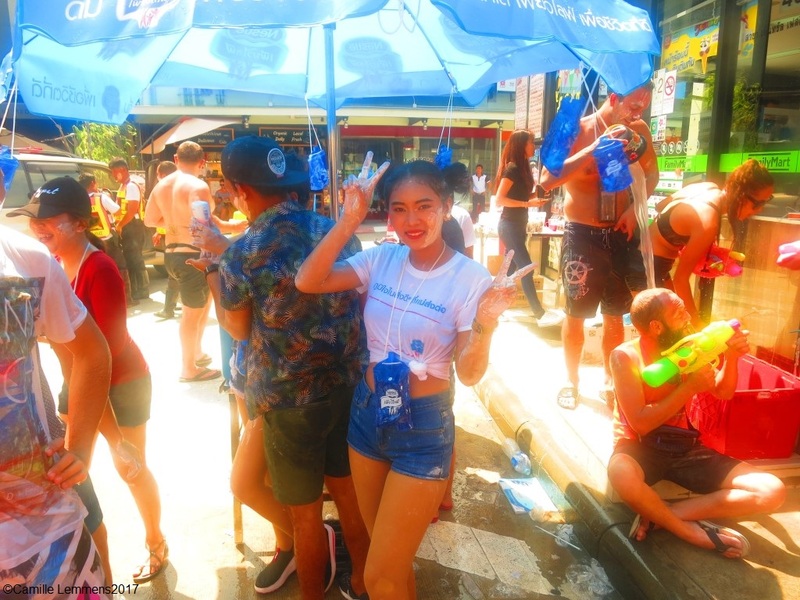 Nonetheless, I hope you will enjoy your stay on Koh Samui during April and especially Songkran, an experience never to forget, especially if it's your first time but also if you're a return reveler!